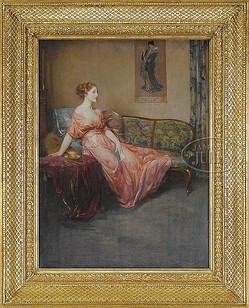 Bell, Edward August; Oil on Wood Panel Painting, signed, Woman on Sofa, Longing for the Arrival. Edward August Bell (American, 1862 to 1953), woman on sofa, Longing for the Arrival, oil on wood panel painting; image credit on full record. Edward August Bell (American, 1862 to 1953), woman on sofa, Longing for the Arrival, oil on wood panel painting. Signed lower left "ED A Bell".